Fish have been on the Earth for over 500 million years – long before even the dinosaurs roamed the planet. 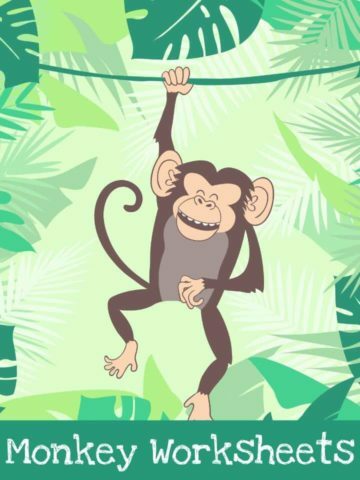 There are over 25,000 species – more than all the species of amphibians, reptiles, birds and mammals combined. 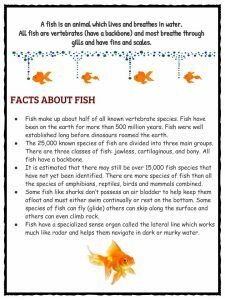 Keep reading for more facts and information on fish. A fish is an animal which lives and breathes in water. All fish are vertebrates (have a backbone) and most breathe through gills and have fins and scales. Fish make up about half of all known vertebrate species. Fish have been on the earth for more than 500 million years. Fish were well established long before dinosaurs roamed the earth. The 25,000 known species of fish are divided into three main groups. There are three classes of fish: jawless, cartilaginous, and bony. All fish have a backbone. It is estimated that there may still be over 15,000 fish species that have not yet been identified. There are more species of fish than all the species of amphibians, reptiles, birds and mammals combined. Fish are cold-blooded, which means their internal body temperature changes as the surrounding temperature changes. 40% of all fish species inhabit fresh water, yet less than .01% of the earth’s water is fresh water. Tropical fish are one of the most popular pets in the U.S. Some fish like sharks don’t possess an air bladder to help keep them afloat and must either swim continually or rest on the bottom. Some species of fish can fly (glide) others can skip along the surface and others can even climb rock. The largest fish is the great whale shark which can reach fifty feet in length. The smallest fish is the Philippine goby that is less than 1/3 of an inch when fully grown. Fish have excellent senses of sight, touch, taste and many possess a good sense of smell and ‘hearing’. Fish feel pain and suffer stress just like mammals and birds. A person who studies fish called an ichthyologist. 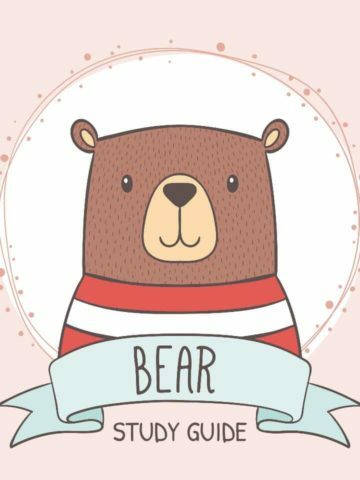 In some species the males and females have different shaped bodies or different coloring; in other species there is no visible difference. 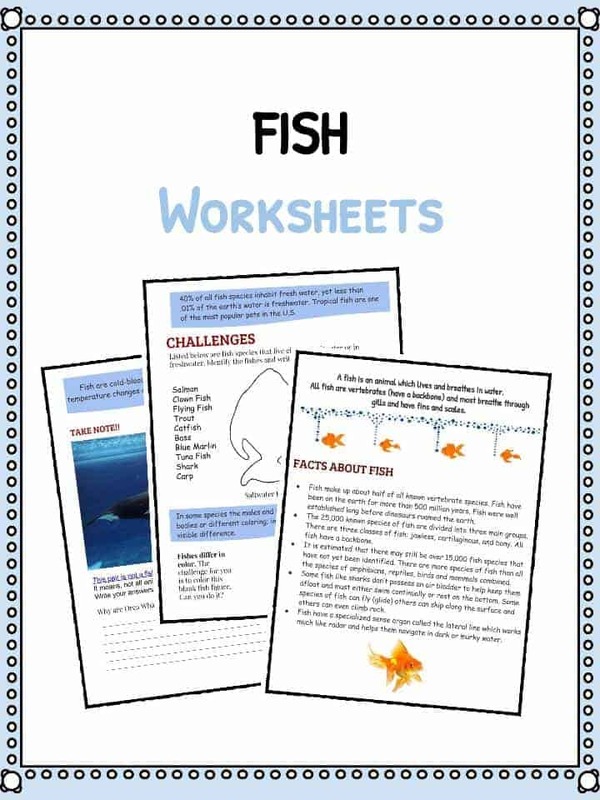 This bundle includes 8 ready-to-use fish worksheets that are perfect for students to learn about the many different species of fish, where they live, what they eat, and much more! Why Are Whales Not Fish? 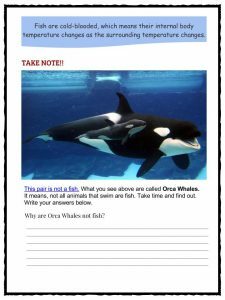 Students will learn that not all animals that swim are fish and, using their own research, will explain why whales are not actually fish. After learning about saltwater and freshwater fish, students will identify the fish and write it on the figures. 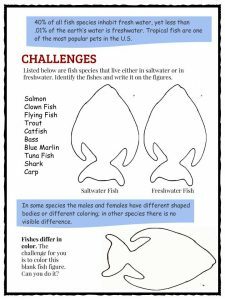 Students will work through the four examples of ancient fish and use their own research to find out what they are and draw them on the page. This worksheet will have the student fill out the data for both a hammerhead shark and a swordfish, explaining what they eat, and where they are usually found. Using a blue colored piece of paper or card, students will follow the instructions in this activity to create their own origami fish. Working through the included source material, the student will then answer a series of questions about poisonous fish. 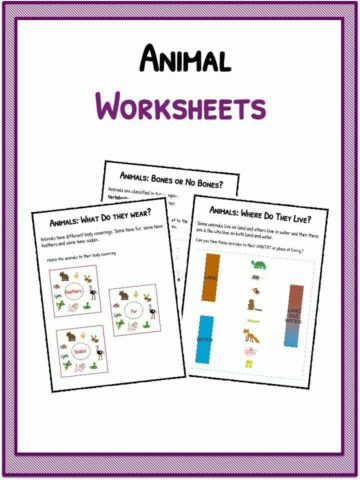 This worksheet goes through eleven reasons fish is good for humans to eat and finishes with the student writing down a fish recipe, including ingredients and how to prepare it. Using the source material provided, students will answer the questions about what would happen to salmon if the climate of the oceans changed.